Namibia is without a doubt one of the most fascinating countries in southern Africa, while Botswana is known for superb wildlife sightings. On this exciting private lodge safari, you will travel off the beaten track. 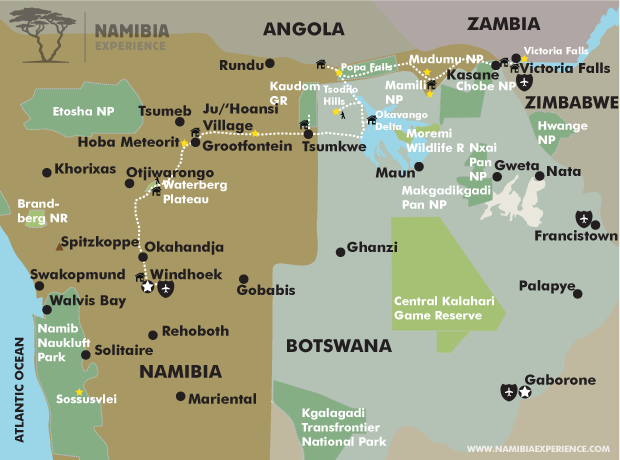 Experience the vastness and solitude of Namibia and the diverse wildlife of the Okavango Delta and Chobe National Park. From Windhoek, you travel through Bushmanland to the Khaudom National Park, making a stop at the Waterberg Plateau. Along the Panhandle you reach the breath-taking Okavango Delta. Making a stop at the UNESCO World Heritage Tsodilo Hills, you reach the Zambezi Region, formerly known as the Caprivi Strip, rich in diverse vegetation. Chobe National Park promises safari at its best, being home to plenty of wildlife. Your journey ends at Victoria Falls visiting the gigantic waterfalls. Experiencing such rich diversity in landscapes as well as fascinating wildlife encounters make this private safari one of a kind. Your transfer driver will welcome you at Windhoek airport and take you to Vondelhof Guest House. Depending on your arrival time in Namibia, you have some time to relax and freshen up before you meet your guide in the afternoon. You spend the afternoon on a city tour, exploring Windhoek: Christ Church, Alte Feste and museum, Tintenpalast and Independence Avenue, formerly known as Kaiserstraße. Dinner will be served at Joe’s Beerhouse (optional). You will overnight at Vondelhof Guest House. After breakfast you leave Windhoek, making your way to the Waterberg Plateau. This giant table mountain, with its more than 45,000 hectare large nature and game reserve, is an important water reservoir for Namibia and home to many wild animals. Once you have arrived at the lodge, you have some time at your leisure. Enjoy the magnificent view across the high terraces. In the afternoon, you embark on a game drive and with a little bit of luck you can spot roan and sable antelopes, giraffes, rhinos, buffaloes and leopards. You will spend the night at Waterberg Plateau Lodge. After an early breakfast, you take off to the Waterberg Plateau Park. Embark on a two-hour hike to the high plateau together with your guide. Be prepared for a little work-out hiking through diverse bush and rock landscapes. You will be rewarded with a spectacular view across the savannah. After the descent and a snack at the restaurant (not included in the tour price), you travel north-east. Close to Grootfontein you see the Hoba meteorite, the world’s largest meteorite ever found to date. You spend the night at Fiume Lodge. You continue east through the bushman land, home of the San. On your way to Tsumkwe you visit a traditionally built village of the Ju/’Hoansi-San. You can look forward to an interesting excursion with your Ju/’Hoansi-San guide. On a tour through the village, you get an extensive idea about the way of life of these hunter gatherers and first people of Namibia. You have the chance to learn the traditional craft of making bow and arrow. In the afternoon, you leave the village making your way to Tsumkwe. Your home for the next two days is Tucsin Tsumkwe Lodge. After sun rise and a nutritious breakfast, you embark on an exciting safari far away from civilisation. 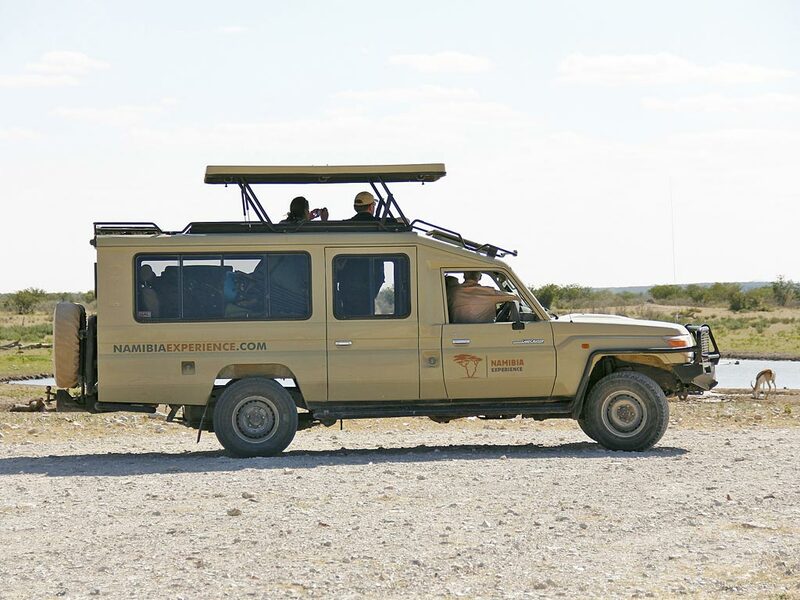 Together with your guide and a local guide of the lodge, you go on a tour of several hours through the Khaudom National Park, one of the most important parks for big game. 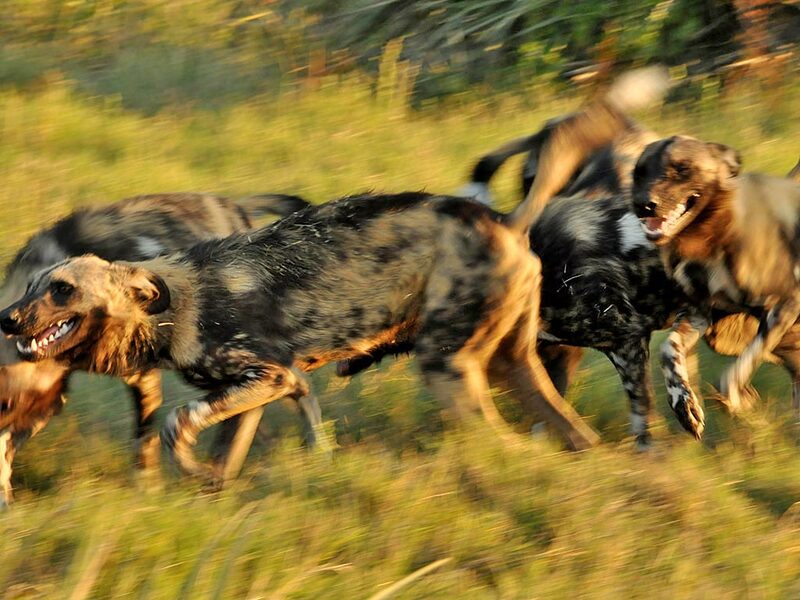 Besides antelopes, the park is home to rare African wild dogs, hyenas, lions, leopards and more than 1,500 elephants. Its location off the beaten track has left this national park in a very pristine condition. This also means, the wild animals are not as accustomed to vehicles as they are in other parks. You can expect an “African bush massage” when driving over the bumpy bush roads. In the late afternoon and after many safari adventures, you return to Tucsin Tsumkwe Lodge where you will spend another night. Today, you will cross the border to Botswana. Start the day with an early breakfast, leaving Tsumkwe behind and crossing over into Botswana near Dobe. On a bumpy 4×4 road you make your way to Nokaneng, continuing on a paved road along the Okavango Panhandle until you reach Etsha 6. Be on the look-out for elephants who frequently pass this way. 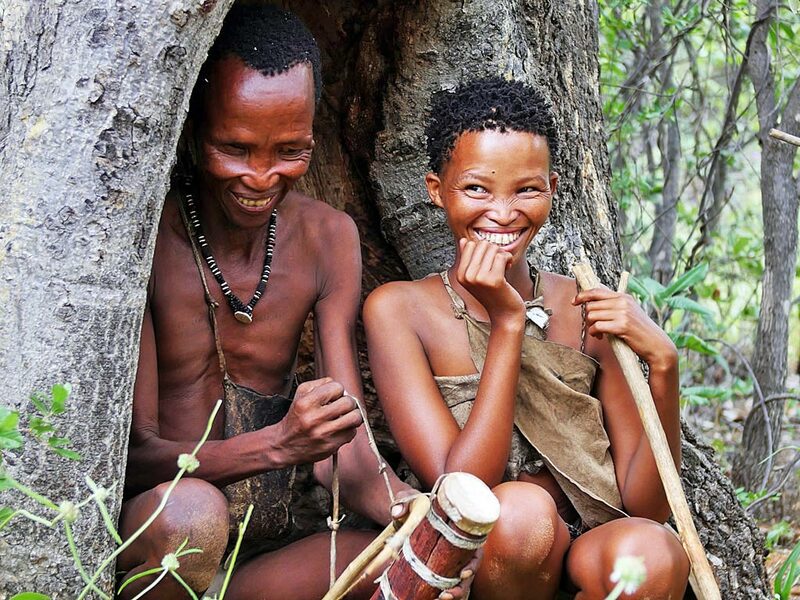 A local guide of the Mopiri Camp is expecting you at Etsha 6. In a transfer vehicle, you are driven through untouched bush landscapes to a jetty. On a boat, you cruise along the Okavango until you reach Mopiri Camp, your home for the coming two nights. Upon arrival, you have a light lunch and time to relax or take a dip in the refreshing pool. 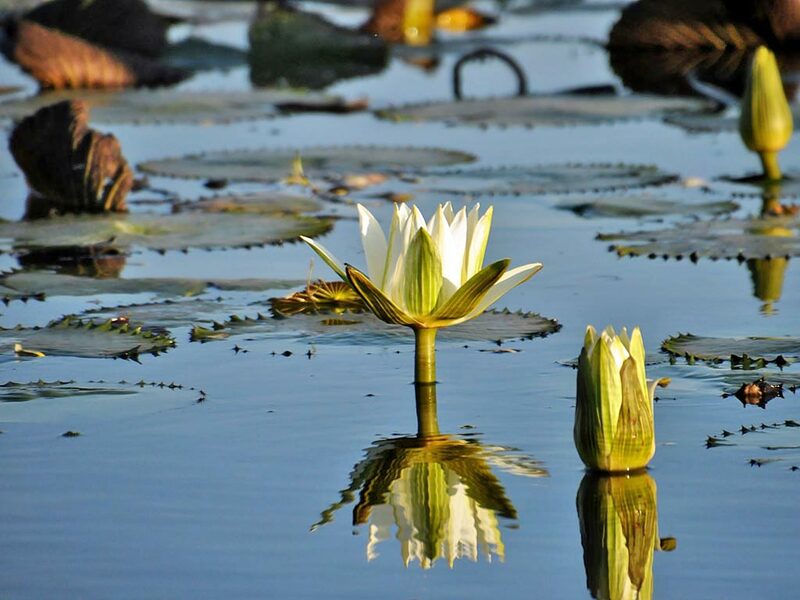 Your time in the Okavango is spent with the fourth element, water. In the morning and afternoon, you go on boat cruises exploring the canals of the delta, discovering stunning and diverse flora and fauna. On bush walks you learn about vegetation and go on tracking expeditions. 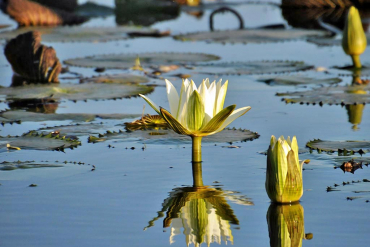 The Okavango Delta is a captivating place and paradise for all bird and nature lovers. With a little luck, you can spot crocodiles, monitor lizards, elephants, various kinds of antelopes and fascinating birdlife. In the evening, enjoy delicious dinners and a romantic atmosphere around the nightly campfire. You will spend two nights at the Mopiri Camp. After a rich breakfast, you leave the Okavango Delta, continuing north together with your guide. Your next destination is Tsodilo Hills – the hill that whispers – which is recognised as UNESCO World Heritage site. These ancient rock formations impress through their sheer size and multitude of well-preserved rock paintings. On a two-hour walk, a local guide will teach you all about the pristine surrounding and some of the rock paintings. Enjoy a picnic in the outdoors before you continue north. You now leave Botswana, returning to Namibia and its Zambezi Region, formerly known as Caprivi Strip, travelling to Mobola Lodge right at the Okavango River. Enjoy a refreshing drink at the Island Bar or go on an optional sunset cruise on the river. For dinner look forward to a traditional braai – a barbeque southern African style – and a crackling campfire. You will spend the night at Mobola Lodge. Start your day with a stop at the Popa Falls before you continue through the Zambezi Region towards Mudumu National Park. On the way, you pass by villages which survive mainly on the selling of fish and on agriculture. With a little luck, you can also spot some big game. You can now look forward to a game drive through Mudumu National Park. The southern part of the park is rich in water making it an attractive area for elephants, zebras, different kinds of antelopes, buffaloes, hippos and crocodile. In the late afternoon you leave the park, driving to Nkasa Lupala Tented Lodge. Here you will spend the next two nights. Accompanied by a local guide of the lodge, you visit the untouched and wild Mamili National Park. Wetlands, marches and dry savannah make for very diverse and scenic views. The park is home to elephants, different kinds of antelopes, hippos and big cats. Mamili National Park is off the beaten track and not as developed as other parks. Be prepared for some bumpy roads. After an exciting game drive, you return to your lodge where you can spend the afternoon at your own leisure. Optionally, you can go on a boat cruise. You will spend another night at Nkasa Lupala Tented Lodge. You leave Namibia to return to Botswana for more wildlife adventures. Once you reach Kasane, you check into Chobe Bakwena Lodge and enjoy a delicious lunch. It is now time to say your goodbyes to your guide who has accompanied you to Kasane all the way from Windhoek. You spend the remaining days with an experienced guide from the lodge. In the coming two days, you get to know the diverse wildlife of the Chobe National Park. With more than 40,000 elephants, this park his home to one of the largest elephant populations compared to its size in southern Africa. On a boat cruise on the Chobe River be on the look-out for crocodiles, hippos and animals that come to the river to quench their thirst. 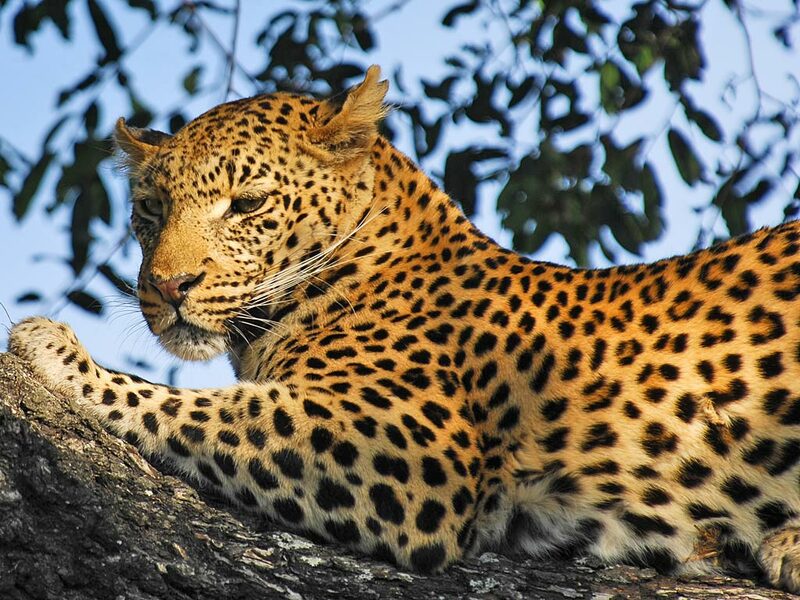 On 4×4 safaris, look for buffalo herds, prides of lions, leopards and other big game. You will spend two nights at Chobe Bakwena Lodge. Today, you will see the majestic and thundering waters of the Victoria Falls. After breakfast, your transfer driver will take you across the border to Victoria Falls. Together with your guide for this day you have lunch at the Lookout Café (lunch not included in the tour price). On an extensive walk, you visit the “Mosi-oa-Tunya”, the smoke that thunders – also known as Victoria Falls. If time allows, you will visit a souvenir market in town. Dinner is served at a restaurant in town (not included in the tour price). You will spend the night at Batonka Guest Lodge. Your adventure across three countries of southern Africa has come to an end. With memories of spectacular landscapes, vegetation and wildlife encounters, your transfer driver will take you to Victoria Falls airport. From here you fly home or continue your travels. Activities as indicated in the itinerary; safari activities in Okavango Delta, Chobe National Park and Victoria Falls are done with a local guide.